Tides aren’t the only things that are rising nowadays – if you haven’t already, you may soon see an increase in your flood insurance premium. This is thanks to a new act passed through congress last July – the Biggert-Waters Flood Insurance Reform Act. This piece of legislation was passed in an effort to recoup the losses of the National Flood Insurance Program due predominantly to Hurricane Katrina, which devastated the Gulf Coast back in 2005. Residences that are not classified as a primary residence. This includes second homes, vacation homes, investment properties, and more. Any and all business properties. Properties that have suffered severe repetitive losses due to flooding. Buildings that require a new flood insurance policy (including both new and pre-existing buildings). In addition to these properties losing their subsidies, this Act has increased the maximum annual rate increase of flood insurance policies from 10% to 20%. Another major change that the Flood Insurance Reform Act has initiated has the potential to greatly affect older properties. When a building is erected, it is built following the existing flood maps and flood specifications, and its flood insurance was always calculated based on the flood maps drawn the year the building was constructed. As flood standards changed over the years, older buildings weren’t penalized. This is all about to change. According to the new legislation, all buildings will be evaluated based on current flood maps, not the flood maps that existed the year the building was constructed. This means that buildings in areas that are now considered to be at risk for floods will probably see a dramatic increase in their flood insurance rates. Thankfully, this change should only truly affects older homes, and homes built in the last decade or two shouldn’t notice much of a change when flood maps are reevaluated. If you have questions about your flood insurance policy, remember that Vargas and Vargas Insurance is always here to answer your questions. We have offered flood insurance to our Massachusetts clients for many years, and we can help you determine how all this new legislation will affect you and your home. We encourage all home and business owners to call 877-550-0025 today to speak to an insurance specialist from Vargas and Vargas Insurance about your flood protection. We will evaluate the effects of the Biggert-Waters Flood Insurance Reform Act on your property, and may also be able to save you some money on your flood insurance premiums! Here at Vargas and Vargas Insurance, we talk to a lot of people about their automobile insurance. We do everything we can to make sure that all of our clients get the coverage that suits their needs. One of the auto insurance topics that we discuss most is the policy’s deductible. You can set your auto insurance deductible low or high, and there are some people that are confused as to why anyone would choose to have a higher deductible. Higher Deductibles Mean Lower Premiums – If you agree to pay a higher deductible in the event of an accident, your insurance provider will agree to let you pay a lower monthly premium. This monthly savings on your collision and comprehensive auto insurance coverage can really add up over time! According to USA Today, raising your auto deductible from $200 to $500 could save you 15% to 30% of your monthly insurance cost. File Fewer Auto Insurance Claims – If your car insurance deductible was a $1000, you wouldn’t bother telling your insurance provider about a measly ding in your car, would you? The goal of an insurance policy is to financially protect what you cannot. If you feel confident that you can cover minor dings and scratches yourself, you probably don’t need a low deductible policy. In addition, it is a well known fact that when you file an auto insurance claim, your policy’s rates may rise. By filing less claims with your insurance provider, therefore, you will be saving yourself from raising your rates due to little, somewhat meaningless, claims. You should really only consider this method if you fulfill a few categories. First and foremost, you should have enough money to cover a higher deductible should you ever need to make a claim. This can be accomplished by putting the money you save on each insurance bill into a separate account just in case of an accident. Second, this method is really only viable for safe drivers. A high deductible is not a good choice for those people that are “accident prone,” as they could end up spending a great deal of money each time they find themselves at fault for an accident. While increasing an auto insurance deductible is the right choice for some car owners, there are others who would not benefit from this tactic. As we said earlier, those who make auto insurance claims often would not benefit from this approach. In addition, you should only attempt to save this money if you are comfortable putting aside your savings until you have your auto deductible within easy reach in its own savings account. This step is vital in ensuring that you are prepared for an accident, should one occur. Remember – you never plan to get in an accident, and they always happen at the most inconvenient times! If you are interested in talking to an automobile insurance expert about how raising your automobile insurance may save you money on your premiums, call 877-550-0025 now to speak to a Vargas and Vargas Insurance representative. Once you know that you need a life insurance policy, finding one that fits your needs can seem like a daunting task. The options appear endless – you need to choose whether you want a whole or term life insurance policy, then you need to settle on how much coverage your life insurance policy needs to offer. If you pass on, you need to ensure that the burden of your final medical expenses and funeral expenses does not fall on your family. This is done by ensuring that these expenses are covered as a part of your life insurance policy. Double check your health insurance policy, and make sure that all of your final medical expenses will be covered. If there are any holes or gaps in your coverage, you can use your life insurance policy to fill them in. Also, it is easy to overlook how costly a funeral can be. Remember that your family will most likely need to cover a bunch of different expenses, including purchasing a gravesite, a casket and burial expenses or cremation expenses. They will also need to cover the cost of a funeral home, and an accompanying service. A life insurance policy needs to be able to cover your remaining financial obligations. These obligations can range greatly, but typically include mortgages, car loans, student loans, and the like. This is, of course, assuming that these obligations are not covered by another type of insurance. For example, a car loan is sometimes covered as a part of your car insurance. If you are unsure of your loan coverage, just ask your insurance agent to review your policies. If you have children under the age of 18 at home, you may wish to include some money for them in your life insurance policy. As an added benefit, this money can sometimes be earmarked. This will ensure that the inheritance is only spent in the way you intend, typically for college tuition or other educational expenses. In addition to covering these three specific things, you need to make sure that your life insurance policy covers the rest of your loved one’s needs. This is best quantified by looking at your household’s current expenses. Add up all of the little things that your family spends money on – like groceries and entertainment. When you are calculating these additional expenses, remember to do your best to account for a changing cost of living due to inflation! If you need help estimating these figures, remember that a life insurance expert is only a phone call away! With a quick and easy call to Vargas and Vargas Insurance at 877-550-0025, you can speak to an insurance representative that will walk you through the steps of determining what level of life insurance you need to make sure that you and your family are protected in case of the unthinkable. So don’t wait – call now! With both Arbor Day and Earth Day upon us, it’s time to think about what you are doing to help out this gorgeous planet that we all call home. Going green may be easier than you think, and you can do something to help out the environment in almost every facet of your life. Use Cold Water: Did you know that 85% of the energy used when washing clothes is spent on heating up the water? If you wash in cold more often, you won’t waste all that extra energy! Unplug Appliances: Even if an appliance is off, it is using a tiny amount of energy if it is plugged in. Take one extra step and unplug your appliances when they’re not in use to avoid this unnecessary energy loss. Manage Your Thermostat: Air conditioning and heating use a lot of energy. If you can keep your thermostat lower in the winter and higher in the summer, you can save energy and save money on your heating and cooling bills! Use Green Fixtures: You can save a lot of water by switching to low-flow showerheads and toilets. If you don’t want to switch over your whole house at once, consider trying these in the bathrooms that are used most often. Use Alternative Transportation: If you can, take a walk or bike to the place that you are going. Also remember, you can sometimes save money on your car insurance by driving less! Make Less Trips: Instead of doing errands one at a time, make an effort to do one errand trip a week. It may seem like a hassle, but you will save a lot of gas. Drive Smart: When you do need to get in the car, make sure that you do your best to drive in an energy efficient manner. Turn Off Your Electronics: At the end of the day, make sure that all of your hardware is fully powered down. Sleep mode will save a little power, but fully shut down electronics are much greener. Save Paper: If you need to print something, make sure that you use both sides of the paper. Also, make sure that paper is recycled instead of just thrown out. Get a Plant: A little greenery will brighten up your office, and it is appropriate with Arbor day right around the corner. Having some greenery at the office also serves many other purposes. A plant will help filter the air you breathe, and can even absorb indoor air pollution! Do you see how easy it is to help the earth? Even if you only pick out a few of these methods to try out, you will be saving precious resources and helping fuel the green movement. Also, remember that we at Vargas and Vargas Insurance want to help you save on your insurance policies! For a free quote or evaluation, call one of our great team members at 877-550-0025 today! As a business owner, you do everything in your power to make sure that your business is marketed to as many potential clients as possible. You may do this through word of mouth advertising, running advertisements in local papers, or through the power of social media. The next step in your business plan should be to close the deal. You must show your customers that the product or service you provide is valuable, and that they will miss out if they decide to pass you up on your offerings. Not every one of your customers will be looking for a premium, all-inclusive package. If you offer different tiers of your products or services, you can broaden your business’s customer base. For example, Vargas and Vargas Insurance offers business insurance policies that can be customized to fit the needs and the budget of any Massachusetts business that needs proper coverage and protection. In this day and age, everything centers around a purchase’s ROI, or return on investment. In layman’s terms, this is exactly how much benefit a client will get from a purchase. If a customer perceives a deal to have a positive ROI, they are much more likely to buy from you. Your business can leverage this fact by making ROI a selling point of your products or services. When speaking to a potential customer, outline all the benefits your product. It can help even more if you can quantify these benefits. Showing concrete evidence to support the products or services you sell can help you take a huge step toward making a sale. If a customer won’t make the deal based solely on what they will gain, sometimes you can tip the scale in your favor by also showing them what they will lose. It is not uncommon for a customer to shy away from making a rushed decision, and for good reason – rash decisions can lead to negative consequences. Your job, though, is to make sure that your customers know what they’re going to lose if they delay acting on your offer. Make your examples specific too: explain their potential losses of reputation, profits, quality of life, or anything else that your product or service stands to improve. If you and your business are able to take advantage of these three simple tips, you will start to close sales like a pro. With some training for your staff and a little practice, you could see your business’s sales and profits start to slowly rise over time. You can even take this opportunity one step further by encouraging your buyers to tell their friends about your products. After all, every business owner knows that the benefits of word of mouth advertising can be astronomical! Call the Vargas & Vargas Insurance staff today to review your business insurance. You want to put your business in a position to sustain itself in case of an insurance loss. Contact us at 877.550.0025. Start Running & Improve Your Health! It’s that time of year already! The Boston Marathon is right around the corner. Many people wonder why anyone would run more than 26 miles just ‘for fun.’ The truth is, running can be a great way to exercise, lose weight, and reduce stress, among many other reasons. You don’t need to be marathon ready to reap the benefits, however. Start slowly and build yourself up. Your body will start conditioning right away, and you will be able to exercise longer and longer as you build up muscle and endurance. Before you hit the pavement, there is one piece of equipment that you will need; good running shoes. Take heed – this does not mean those old tennis shoes that have been buried in your closet for the last 10 years. Your shoes will be your foundation, so you need to make sure that they are solid. If you need help picking out a new pair, check out this guide from REI. Once you have the right shoes, you need the right mindset. It’s easy to get overly excited when you start something new. Reign in your energy, and start slow. It is important to let your body ease into the effort that running takes. Start out running for a few minutes, then walking for a few minutes. As that process gets easier, you can increase the amount of time you run in each set. Eventually you will be able to run outright. Before you do your running for the day, make sure that you stretch out your muscles first. A few minutes of walking and another few minutes of stretches can significantly reduce your risk of injury while you run. If you are a treadmill runner, make sure that you are familiar with your machine. Read all of its instructions before you begin, and always wear the safety key if one is available. Also make sure that your treadmill is in a safe place, and away from children, pets, and fragile objects. Ensure that you are visible. Wear reflective or bright clothing so that drivers can see you easily. Carry the essentials. While you want to run as unburdened as possible, you should always carry identification (like this Shoe ID) and a cell phone. In case of emergency, you may also wish to carry a small amount of cash or an ATM card. Pay attention to your surroundings. Don’t tune out the world if you run outdoors. You need to pay attention to what is going on around you! Make sure that you can hear everything as well – don’t blast music or an audio book, as it could hinder your ability to hear car horns or other pedestrians. Tell someone where you will be. It is important that someone know the route you will be taking, in case of emergency. If possible, leave a map of your course with a friend or family member. If you follow these tips and guidelines, you can start reaping the health benefits right away! Running can help you burn fat, improve coordination and versatility, relieve stress, and prevent loss of bone and muscle, among many other factors. Running is even so beneficial that it can help you to prevent medical catastrophes such as heart attacks, stroke, and certain types of cancer. We know that you are protected by your health insurance if these conditions were to affect you, but wouldn’t you rather prevent them in the first place? If you do need to discuss your health insurance coverage, please call our office at 877.550.0025. It doesn’t matter whether you run a construction site or an office building – there is always the chance that one of your employees could be injured while at work. As an employer, it is your responsibility to make sure that your workplace follows the laws and regulations established by the Occupational Safety & Health Administration (OSHA). Even when all these guidelines are followed, though, there is the chance that an employee could get hurt. The most important part of the process is making sure that your employee is given the appropriate medical attention. If the injury needs immediate attention, call an ambulance right away. Remember, if you are on the fence about getting emergency medical help, it is always better to be safe than sorry. If your employee’s injury does not require immediate attention, you should still encourage them to seek medical care from an approved provider as soon as possible. In the event of an accident in your workplace, you have a few very important responsibilities. It is up to you to act as a liaison between your injured employee and your workers compensation insurance provider, ensuring that all of the correct paperwork is completed correctly and in a timely manner. If you have questions about your role in the event of an incident, you can always call 877-550-0025 to speak to a Vargas and Vargas insurance agent. We can help provide the expertise you need when it comes to filing insurance claims like these. The injured employee’s account of the incident. Reports from anyone that witnessed the accident. Photos or video of the area where the accident occurred. The more information you have, the easier it will be for you to fill out your claim form! The Employer’s Report of Accident is your opportunity to tell your side of the story. Using all the facts that you gathered in the previous step, you need to tell the insurance company what you know. This is also where you can indicate if you think there is any validity to your employee’s claim. Once this section of the workers’ compensation form is filled out, your insurance agent should be ready to officially file your employee’s claim. Once your claim is filed, you could wait up to 90 days to find out whether it has been approved or denied. During this time, it is important for you to stay on top of the process. Make sure that any questions or requests from your insurance provider are answered in a timely manner, and make sure to also check on your employee’s recovery. If you follow all five of these steps after an employee is injured, you should be able to breeze through the workers’ compensation claim process. And remember, Vargas and Vargas Insurance is here to help if you get lost or stuck along the way! While it (finally) seems time to put away the snow shovels, scientists around the world warn that blockbuster storms such as Nemo and Saturn are likely to become the norm. Weather patterns currently are in a state of upheaval, bringing with them more powerful storms, floods and droughts. So, how will the climate change affect homeowners insurance, and what can you do to protect your home? While the full extent of the climate change remains unclear, it does increase your home’s exposure to potential storm-related damages. Currently, insurers price winter storms into their home policies. Yet these recent storms have caused damages that extend beyond those covered in typical policies. As a result, it is likely that homeowners insurance rates will inflate in upcoming years to account for the increased damage potential. Therefore, it is important to take certain precautions to keep your house protected and your costs down. Reduce the risk of tree damage. Spending a little money now may stop a tree from turning into a big cost later. Schedule regular maintenance, and have your trees inspected on average every five years. If a branch is hanging within 10 feet of your house or in need of buttressing, the arborist will arrange for workers to fix it before it becomes a danger next winter. While this means you need to budget for maintenance, CNN Money cites the trees will more than cover those costs over time. For example, larger trees provide protection from basement flooding; their shade can reduce air conditioning costs, and they block harsh winter winds that make the house colder and raise heating expenses. For tree maintenance services in and around Boston, visit the YellowPages. 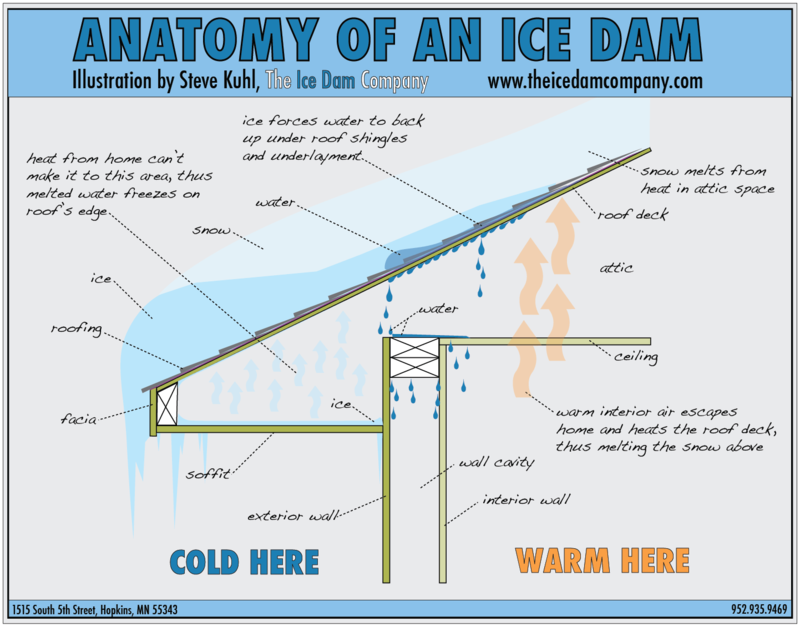 Prevent ice dams. Ice dams form when warm air leaks through your roof and melts the snow, which refreezes when it reaches the roof’s cold overhang. This causes water to back up and leak into the home, ruining walls, ceilings and insulation. Fortunately, this damage is preventable by ensuring that your roof is properly insulated and ventilated. Center-Point Energy and Energy Star are good resources for show how to do the project yourself. Or, for trusted businesses in the area that can help with insulation, visit Superpages. Additionally, having a properly insulated and ventilated roof will do more than prevent ice dams and protect your home from next winter’s damage. According to the U.S. Green Building Council, a well-insulated roof can drastically reduce your heating and cooling needs along with your electricity bill and your home’s emissions. For more ways to make your roof energy-efficient, visit the Green Home Guide. Protect against high winds. According to FEMA, protecting your home from damages that high wind speeds cause is one of the most important tasks you can do to avoid nightmare costs and perils. Make sure to check that your doors, windows, roof and garage – which are the areas of weakness against the wind – are secure and strong enough to withstand high speeds. You may have to purchase reinforcing bolt kits for doors, especially ones that are double entry. It also is a good idea to get storm shutters, but check with your local building official first to see if a building permit is required. In addition to buttressing your doors and windows from high winds, Against the Wind details how to protect your roof and garage. Furthermore, it is a good idea to speak with your insurance agent to ensure your homeowners insurance policy provides you with the right coverage for your area. We can also assist you with coverages you may need in addition to your homeowners policy. Vargas & Vargas Insurance is dedicated to meeting all of your coverage needs at a price you can afford. Call and speak with a friendly agent today at 877-550-0025.